I am excited for this guest post today. This is a topic I have wanted covered on my blog for a long time. I hope this post can give you some comfort and hope. If you or loved ones around you think you might be having some PPD, please do not hesitate to talk to your doctor about it. It is no more shameful than high cholesterol or high blood pressure. And with that, here is the post. Over a year ago I was diagnosed with postpartum depression. It was surprising and scary at the time because it was my second pregnancy and childbirth, and I hadn’t been depressed at all after my first was born (crazy mood swings, yes; depression, no). My pregnancies were healthy, my deliveries were smooth, my children were healthy. I didn’t think I was the “type” to get postpartum depression (a line of thinking that was very judgmental of me, I now see in retrospect). I think part of what made it so hard for me at the beginning was not understanding what depression really was; all the misconceptions I had. That’s what I want to do: help you understand, whether you’re going through it or you know someone who is or even might someday. So here’s a little of what it was like for me. Let’s pretend that everyone has something called a happy jar. You walk around with this happy jar, experiencing life, and when positive things happen to you, drops fall into your jar and fill it up (I imagine it as a golden-colored liquid that emits a warm glow). Seeing the sunshine, a compliment, a smile from your baby, lunch out with a friend, a moment of spirituality—all of these things drop happiness into your jar. But you can loose your happiness, too. Negative things evaporate those happy drops away. For every stressful traffic jam, for every awkward social situation, for every frazzled sleepless night, a few drops can be lost. I used to think that depression meant having a very empty happy jar. But now that I’ve gone through depression, I realize that wasn’t right. For me, it wasn’t like having an empty happy jar. It was more like losing my jar altogether. With my jar lost, it wasn’t necessarily that I was sad. I just couldn’t experience happiness fully. When others noticed I was down and found out I was depressed, they showered me in love: compliments, girls’ nights out, lunch at my favorite restaurant, shopping trips. But the frustrating thing for me was desperately trying to catch all of this happiness, then watching it slip through my fingers because I didn’t have my happy jar. Don’t get me wrong, the positivity and love around me did help. It just wasn’t the solution. What I really needed was to find my jar. Look at that little flower—it’s technically a weed, but it’s still so pretty. All of God’s creations are. Why can’t my yard always look nice and perfect like the Jones’s? Poor little dandelion. Trying so hard to be a pretty flower. But all it’ll ever be is a weed. You know those old jukeboxes, with the stack of CDs, and you select a song and the mechanical arm inside goes to the right CD and picks it for you? Say there’s one of those in your head. The CDs are the many interpretations for a sight or sound you might experience. Your brain is the mechanical jukebox arm, which selects one of the CDs, forming thoughts from things around you all day long. In a healthy brain, your personality and your character and your effort all go into which CD the jukebox selects. If you’re a positive person in general, or you’re making an extra effort to be positive that day, you can select more positive interpretations. Depression is your brain getting sick, just like any part of your body might. And for me, a depressed brain was one that automatically picked the most negative interpretation for all stimuli, always. For example, the last dandelion thought above is one that I would have had (and actually did when I saw a dandelion in the yard one depressed day). That’s why when you have depression it feels like nothing is working. It feels like nothing makes you feel better. It feels like everything anyone says or does doesn’t even make a dent in your mood, or maybe even makes it worse. Your brain is interpreting even the positive things in your life as negative. No matter what my brain had to do (including come up with completely irrational interpretations), no matter what I fed it, the output was always negative. That’s why depression is so hard. But it’s also why it’s so not you. It’s not your character, it’s not your personality, it’s not who you truly are. It’s your brain malfunctioning, and all it needs to do is be healed. And postpartum depression can be treated. You just need to facilitate the natural healing process (with things like medication, therapy, and good self care) to help your brain heal—just as you would do those same things to help a broken leg heal. You wouldn’t just sit at home, blaming yourself for breaking your leg and figuring you have to be like that forever. Depression is the same. It stinks, but it’s not your fault, and you need help to heal. Still, depression is hard. So, so hard. There’s no way around that. I feel for you so much if you’re going through it now or have in the past. 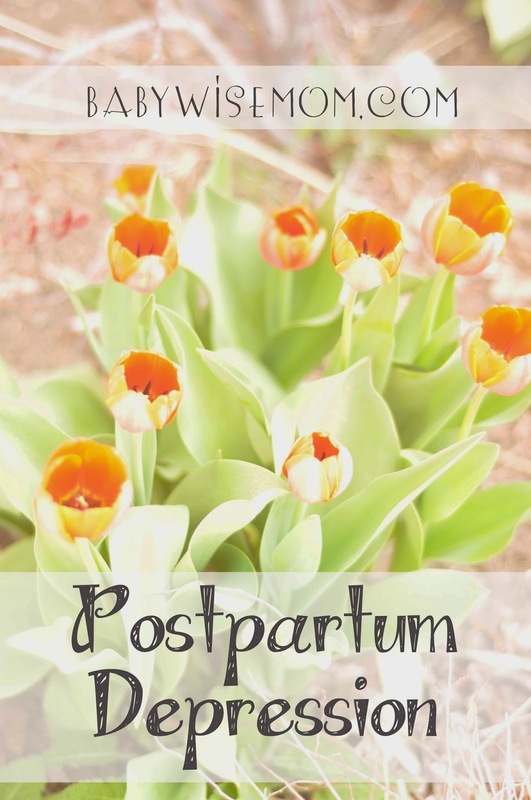 One thing that seemed especially hard for me was being a Babywise mom going through PPD. As Babywise moms, in general, I think we try to be pretty organized, proactive, and diligent. Getting postpartum depression completely turned my life upside down. It’s just such a hard illness. So in the beginning, it seemed like all Babywise (and good parenting in general) was thrown out the window. My husband and I were in survival mode. Normal motherhood guilt can be pretty bad. Depression motherhood guilt is like that times a hundred. And add on to that Babywise guilt? Guilt that I wasn’t keeping the log, that I was messing up sleep training, that my mom often rocked my baby to sleep; guilt that I wasn’t continuing independent playtime for my toddler. It was crushing. Literally debilitating. But, to moms who might feel like I did, I want to say that the guilt is unfounded. Maybe it won’t stop you from feeling it, but maybe at least knowing that it’s irrational can help. My postpartum depression hit when my baby was three weeks old. She wasn’t sleep trained yet. For a long time I figured that I had just “failed” when it came to Babywise and her completely—or maybe I’d have to do some major catch-up because she had fallen so behind. But looking back now (my daughter turned one last month), I can see that it wasn’t true at all. My daughter sleeps through the night; she did at three months. She hit all the normal milestones. She’s happy and giggly and fun and all of us (me, my husband, her brother) love her to pieces and each want to be the first one to get her when she wakes up from naps. Yes, I’ll admit that I think she’s one special baby. 🙂 But the main point is, depression doesn’t make it impossible for you to be a Babywise mom, or to be whatever type of amazing mom you aspired to be, for that matter. It was hard for me to believe that for a long time, but now I can definitely see that it’s true. All that said, I would definitely recommend staying away from parenting books if they make you feel worse. I know for me they did. I read parenting books and blogs all the time before my baby was born. I took notes. But after the depression hit, each bit of advice I read was just one other thing to feel guilty for, one other thing my brain could point to and say, “See? You’re not doing that! You’re failing!” It was so sad because it wasn’t just parenting blogs that did that: it was lots of things. Like the religious talks that I love. Or even compliments. (“Your baby is so smart!” So smart? Is she too smart? Does that mean I’ve pushed her too hard? I’m such a heartless mother!). I guess it’s just a very rough symptom of depression. But don’t think you need to feel bad that those things do make you feel bad. It doesn’t mean you’re a bad mom or that you can’t handle it. It just means you’re depressed. So just don’t read parenting books or blogs for a while. Focus on the basics, the essentials. That’s often what we do when we get sick, anyway. Other illnesses (which can be completely awful) still help us grow and learn, strengthen our character. Postpartum depression can do the same. Babywise, Act 2, Scene 1: What is this?! I'm stumbling upon this at the end of my depression (that's to say that I found my happy jar and it's still pretty empty, but it's currently being filled again) and I can't say enough how well you touched this subject! I've read many different blogs and articles on depression and while I can understand what they mean when they describe depression I get frustrated because I feel that it doesn't truly describe it to those who have never experienced it. It's like trying to describe a lily to a person who was born blind, who has never seen color or flowers. How do you describe that lily to them?!!? Same thing with depression, it's extremely difficult to describe something that someone has never experienced on any level. BUT I feel that this is the very best description to non-depressed people I've found so far! I love the "happy jar" analogy, but also the description about how no matter what you try to feed your brain, it only outputs negative. No. Matter. How. Hard. You. Try. I can't wait to share this with my loved ones who are walking this journey with me lovingly but with little understanding. I am so glad you found it helpful and that you found your happy jar!